Polycom, Inc. (Nasdaq: PLCM) today unveiled innovative collaboration solutions at an exclusive customer event in New York focused on advancing the workplace of the future globally. “Work” has drastically changed from a place we go to – into something that we do, irrespective of time, location and devices we use. Traditional offices and meeting rooms are giving way to open, team and mobile spaces as well as small/huddle rooms, all of which present challenges for effective collaboration. In order for collaboration and teamwork to thrive in the workplace of the future, organizations need the right tools. Globalization, productivity gains, time to market, cost control, maximizing and attracting the right talent are all fundamentals that organizations are managing on a day-to-day basis. Collaborative solutions need to be easy to use and fit into any size workspace. Polycom’s latest solutions are engineered to uniquely address these challenges with elegance and simplicity enabling customers to collaborate more effectively across a broader array of workspaces. 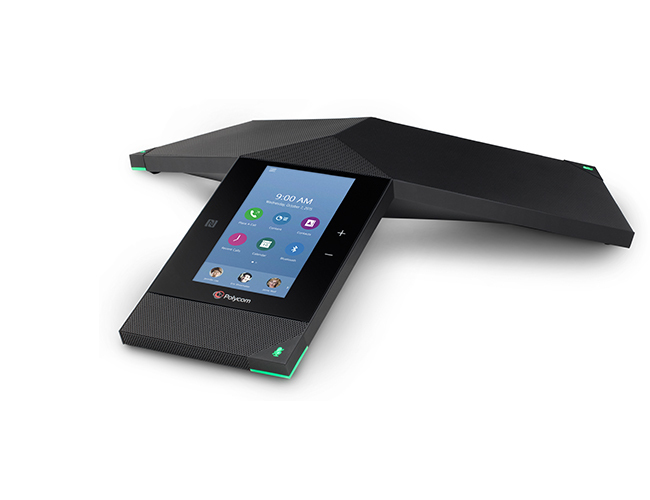 Polycom® RealPresence Trio™, the smart hub for all meeting spaces – Polycom RealPresence Trio is the first smart hub for group collaboration that transforms the iconic three-point conference phone into a voice, content-sharing and video system that can fit into any team environment. Meetings start quickly with one-touch integration with calendars, where the most advanced audio performance provides the clearest and richest connection in the industry. Participants can easily pair mobile devices or laptops to the RealPresence Trio solution to share content in HD quality. Add a simple webcam and now RealPresence Trio is a full visual collaboration solution that turns any space into a high-powered work hub. Easy to deploy, RealPresence Trio technology has broad interoperability and deep integration across multiple UC platforms including Skype for Business and Microsoft Lync, BroadSoft and others.